I’m sure you’ve been to many parties where you’ve noticed the host wasn’t around much? You see him scrambling back and forth between the kitchen and his grill. You’re wondering, does he have everything under control or is the food in a ball of flame? It’s understandable. It’s hard to grill the main course outside while simultaneously cooking veggies on the stove inside so you can serve everything at the same time. However, with some preparation before the party, help from your significant others, and by using one of the best grill baskets for vegetables and fish that we discuss in this article, you’ll look like a catering genius. 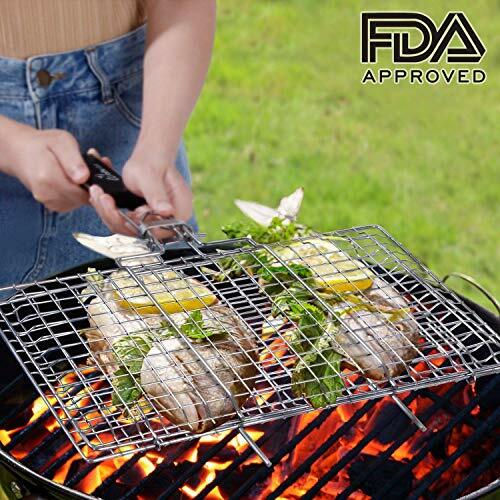 Following is a discussion on an incredibly useful tool to allow you to prepare vegetables, fish and side dishes right there at your grill, without fear of small or delicate items falling through grates onto the coals. The grill basket. We will show you the advantages to their use, the things you can cook in them, and how they can lead to a more organized and less stressful party when grilling veggies, fish or burgers. What is a Grill Basket? A typical grill basket consists of two rectangular pieces of thick wire mesh hinged together on one side and a long handle on the other. The food stays in place by closing the two handles together like a waffle iron with the food sandwiched between the two halves of the wire mesh. The wire mesh allows the marinade or oil to drip through while keeping your food from falling in between the grates or into the coals over an open fire. Besides the traditional grill basket, there is another style. Shaped like a bowl or shallow pan, this second type is also called a grill wok. 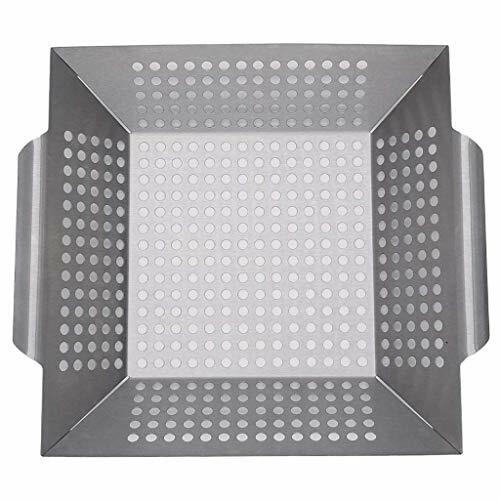 They are perforated sheet metal baskets, usually stainless-steel, with raised sides and open tops that resemble a square metal bowl with holes all around. Most grill baskets are stainless steel or steel coated with chrome or a nonstick surface. If you’re a frequent barbecuer grilling multiple pieces of seafood and veggies, then a grill basket is the time-saving utensil to have. You’ll also find some grill woks made from cast iron, but they are heavy and have fewer perforations to let the smoke permeate the vegetables. Here is a quick one-minute video to see one in action and give you an idea of how to use one for grilling vegetables. Grill baskets are versatile. You can cook any food with them as long as they fit inside. However, due to the thin wire mesh, soft foods like burgers or skinless chicken can stick. The food may not have the beautiful grill marks you get from cooking directly on the grill grates, but, if you’re cooking over an open campfire, a basket is the way to go. So, what else besides veg can we cook in one? For wings, quartered chicken and fish, make sure to use a hinged grill basket with a handle. Your glazed chicken will stay in place while you’re turning them back and forth for a nice savory char on both sides. 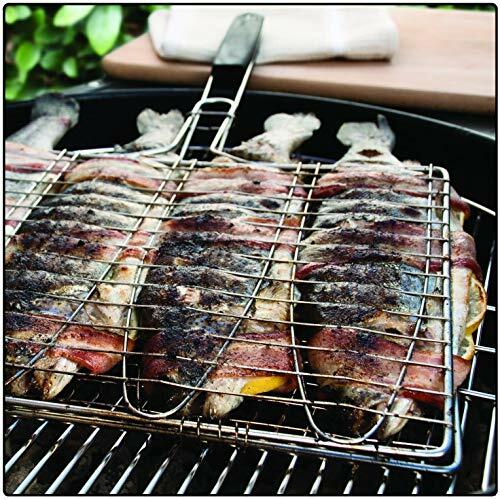 Nestling a whole fish in a grill basket will prevent it from falling apart as you flip it. Make sure you buy one that’s deep enough to hold an entire fish without crushing it like a garlic press. Also, be sure to coat the mesh of your grill basket with nonstick cooking spray to prevent your food from sticking. Skewered food like satay or shish kebab is always a favorite and fun to eat. Unfortunately, if you’re the one making them, they can take several hours to prepare. And, unless you have the right satay grill you’ll end up torching the skewers or your hand as you try to flip them one by one. Don’t want to use skewers? Here’s a trick you can use. Toss the meat and veggies with your favorite marinade and place them in a grill basket instead of spending an hour threading them on a skewer. You’ll get that perfect kebab sear minus the gooey mess from the skewers! For marinated vegetables like tomatoes, onions, and mushrooms, use the perforated, bowl-like products. You can toss and turn them around to cook them evenly like stir-fry. For larger chunks, use a hinged basket to hold and flip them as they brown. Side dishes such as potatoes, beans, broccoli, mushrooms, zucchini, peppers, onions or tomatoes are delicious on the grill. Cut them into equal sizes, season and place them in the grill basket, cooking them at the same time as the meat, so you’re not cooking twice or running around like a crazy person from garden to stove. You’re all set for a great party. Grilling root vegetables adds a flavor dimension that you can’t get on the stove top. Here is a “Grill Basket Stew” recipe worth trying. Although they recommend ‘Beefalo’, any red meat will work. The grilled vegetables are the star of the dish. If you have a lot of burgers to cook, wouldn’t it be nice to be able to cook and flip them all at the same time instead of one by one? Using a grill basket, you can flip six burgers at a time instead of standing there sweating over the hot coals and holding up a summer party. You can make a bunch of sliders all at once s people can eat ta the same time too. Make sure the burgers are the same size and thickness so that they cook at the same rate and are ready at the same time. I know I have mentioned several benefits earlier, but they’re worth repeating. A quality model is sturdy, most are light and hold four to six portions of seafood or veggies. Your food looks and tastes better with flavorful char and a touch of smoke that you can’t get from cooking on the stove. You have better control over your chopped, sliced and diced ingredients. No more dropping food through the grates. A quality model is durable and able to stand up to the high temperatures. Clean with a brush and soapy water. Smaller baskets are dishwasher safe. Cooking in a basket is more forgiving. You can stir or flip the food every 3 to 4 minutes without it burning, keeping your meal together, and you can pay it less attention so you can enjoy more time with your guests. Cooking on the grill or barbecue means you’re dealing with high temperature. Make sure any model you consider is made with thick enough metal wire or sheet metal to withstand the high heat without burning through or warping out of shape. Look for models with holes that aren’t too big. Otherwise, your food will slip out and into the fire. Also, feel with your fingers around the wire mesh to ensure that it’s smooth, with no rough or sharp edges. For bowl-type baskets, choose the one with higher sides, for when you need to toss your veggies. The ones with long handles are better so you can turn your food rather than cook your knuckles. If you have a choice, nonstick finishes are easier to clean than bare metal. Unfortunately, not all manufacturers use non-stick coatings. Here are the options you should consider for your next grill basket. 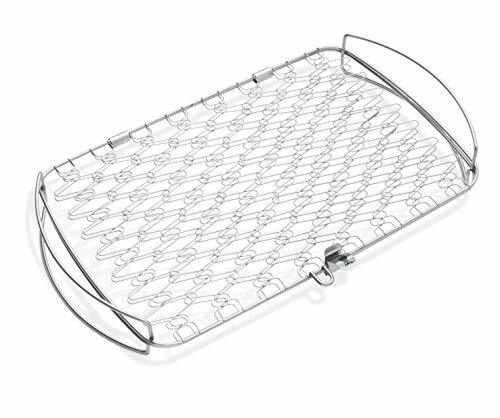 Weber designed the 6471fish basket to fit their smaller Q 300 range. It does not have a handle which means you’ll need gloves to turn it, but you can cook with the cover closed. The dimensions are 18 x 2.3 x 10.5 inches, enough for six portions of fish fillets. The spring-like mesh holds the fish in place without crushing it. Easy to use, just turn once. Holds enough fish for six people. The curved handles support the fish above the grates, so you don’t get nice grill marks. Food can fall out the ends as the mesh is not attached. The companion is a great fish basket whether you’re grilling in the backyard or the back country. The long handle makes it ideal for cooking over an open fire. The stainless-steel construction means you don’t have to worry about rust. It cleans up well with soap, water, and a stiff brush. The 14.6 x 24.1inch area will hold four fillets or two average sized whole tilapias. The loose coil springs act as a hinge on one side and give about 1-inch clearance – enough for whole trout – and he handles hold together with a sliding metal loop. Unlike other closeable options, the SMAID vegetable grill basket is more like a rectangular perforated wok. The perforations allow excess juice to run off while smoke and flame flavor the veggies. The beautiful thing about cooking in one of these is that you don’t worry about your sliced and diced veggies falling through the grates. This stainless-steel model measures 13.1 x 11.6 x 3.3 inches and comes with two built-in curved handles. You don’t need to waste aluminum foil anymore or worry about your food falling when the foil rips. 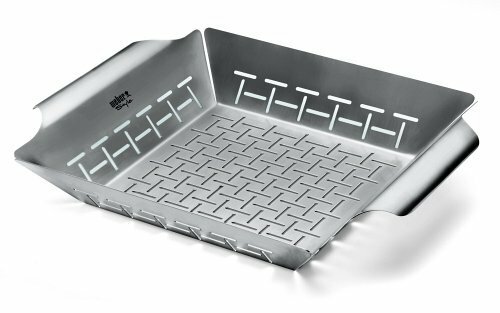 The Weber all-stainless-steel basket is part bowl and part pan. It safely holds the smallest sliced and diced veggies while allowing smoky flavor and flames to sear the vegetables. The surface area measures 2.5″ H x 11.8″ W x 13.8″ D.
Charcoal companion designed this grill basket to work at home or out camping. The entire product has a non-stick coating for easier cleanup. It has a long wooden handle made from rosewood as a grip, for more comfortable handling. The top half removes for loading, the basket adjusts to the thickness of produce inside, and then the front tabs lock in place at the height of the food, up to 2 inches thick. This product measures 12.6 x 24 x 2.4 inches, excluding the handle. The only drawback is that one side is a little higher off the grill than the other, so when turning, one side may need longer to cook than the other. Because of the design, one side is always closer to the grill than the other. With this model, you get the best of both types of baskets. The WolfWise has a detachable 5.9 inches handle that not only keeps it cool but allows you to close the lid on most grills. It is the deepest of the folding baskets at 2.4 inches deep, enough to roast corn on the cob or lobster tails. The overall dimensions are 11.8 x 9.4 x 2.4inches, giving you plenty of room for thick cut veggies or whole fish. The removable top adjusts to three different heights to accommodate different sized foods. This product is dishwasher safe because it’s made of 430-grade stainless steel. The latch is not as secure as it could be. If you’re only going to buy one style of grill basket, a hinged-type with a handle is the way to go. They allow you to cook everything from seafood to veggies, even the same time if they are of the same thickness. The wok-type is an excellent companion that lets you cook vegetables on one part of the grill while you tend to the main course. The perforations allow excess water to run off and delicious smoky flavor to get in. 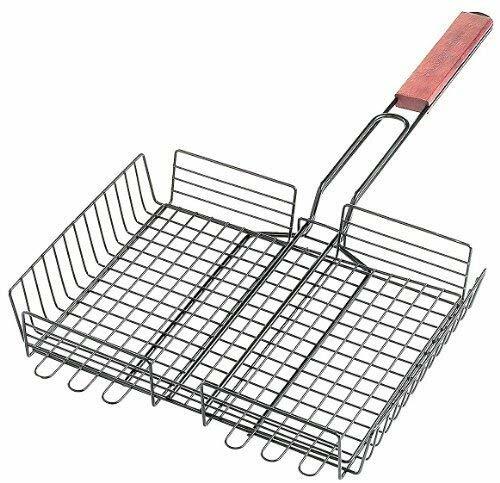 My pick for best grill basket is the charcoal companion rosewood handle grilling basket. It has a sturdy handle that won’t pop off unexpectedly, and it’s deep enough for thick steaks, whole fish or corn on the cob. It also adjusts to hold thin items like fish fillets or asparagus firmly. Let me know what model you choose so we can share your thoughts and experience here. I’m always looking for your honest feedback. Don’t forget to pass this article along to your grillin’ buddies!